Each year, purveyors and consumers of all things relating to industrial and electrical automation crowd the booths at the SPS IPC Drives exhibition. This year offered up a wide array of exhibits featuring the latest and greatest in industrial automation trends, topics and technologies. For this week’s blog, we caught up with the Belden team members who attended SPS IPC Drives 2017 in Nuremberg, Germany to get a better understanding of what the event had to offer. Q: Why does Belden actively participate in SPS Drives? What makes it stand out from other exhibitions? A: The SPS show is the premiere show in Europe, and perhaps globally, for the latest trends in automation. Due to its importance, companies invest a lot in very innovative booths that are far more imaginative than your typical tabletop setup. Because of this, it offers the perfect platform for Belden to show the latest IIoT innovations and experience the newest products and solutions for industrial communication. Events such as these are great learning opportunities, as they literally show the benefits of increased automation versus simply telling people about it. Q: It sounds like the exhibits offered much to learn for visitors. What was the focus of Belden’s presence? What did you bring to share with the industry? A: Our message this year was one of innovation. We showed off several new products, such as our DRAGON PTN switch with MPLS technology, our Li0N-Power I/O modules with embedded Distributed Control Units (DCUs), and our new MachFlex high-flex cable line. Belden also demonstrated how Time Sensitive Networking (TSN) – a very popular subject at this year’s event – is enabling a lot of this new technology to work more efficiently. Q: Going into the event, what did you expect to see? Which topics, trends or technologies ended up standing out the most? A: This is an event we attend every year, but a few of our team members had not attended the SPS IPC Drives event before. While they knew it was a very large-scale event, it’s safe to say that the truly massive scope of the event far exceeded their expectations. We spent a lot of time visiting other exhibits. In the end, talk of TSN networking technologies and high bandwidth network devices seemed to be a common thread in most areas. While Belden has been a pioneer in development of this technology, we were surprised and excited to see it featured prominently in so many other booths! SPS IPC Drives is the leading exhibition in Europe for electronic automation. This graphic provides some numbers on just how big this year's event was. Q: What do you want customers who couldn’t attend the show to know about Belden in relation to these trends and technologies? A: Belden showed off the world’s first I/O modules to support all three standard industrial Ethernet protocols - PROFINET, EtherNet/IP and EtherCAT – in one single device, now as a 16DIO version. This universal device can be installed in new machines/applications, but it can also be used when retrofitting is necessary. Traditionally, every I/O system supplier has its own bit mapping, but this Lumberg Automation universal device is able to convert those so there is no need to change the program anymore, saving a significant amount of engineering time. Hirschmann showed off some impressively seamless, secure and reliable solutions for secure remote access of machines, using a filling and packaging machine as an example. They also featured compact and cost-effective wireless operation of machines and shuttle systems in a logistics environment, to demonstrate support for the trend towards intelligent and smart machines. Finally, Hirschmann showed that they are the leading company for TSN-ready communication systems for time critical/deterministic applications. We’re committed to furthering the TSN technology and will deliver TSN-supported industrial Ethernet switches that carry the “TSN Ready” logo in the near future. The entire Belden portfolio of brands is dedicated to continuously innovating and adding new features and technologies that are designed to make your life easier! Q: This year, the event featured a new area themed around the challenges of working with production technologies. Did you have a chance to visit this exhibit? What were your impressions? What industry challenges or concerns did you hear people discuss most? A: Several of us had the opportunity to visit and were left with a pretty clear idea of how the industry is changing. The interplay between production technologies, IT platforms and artificial intelligence is driving the digital transformation of the global industry. Future-proof communication networks and flexible connectivity systems facilitate completely new forms of business, work and collaboration. Technologies that support things, such as miniaturization and digitization, play a key role in the context of an effective Industrie 4.0 production. In response to technologies, such as increasingly smaller sensors and actuators, there is an increasing demand for smaller and more flexible communication solutions. Other technologies that support things like data collection, analyzing and predictive maintenance in a production environment require intelligent and smart machines. These machines are equipped with state of the art connectivity and network systems that keep up with the requirements of the future and guarantee secure and highly reliable data communication in an industrial environment. This also changes the role of factory workers, who now have direct access to all relevant production and machine data. Intelligent machines support them in their quick, onsite decision-making. It’s clear to see how these technologies have created a ripple-effect in the industry. 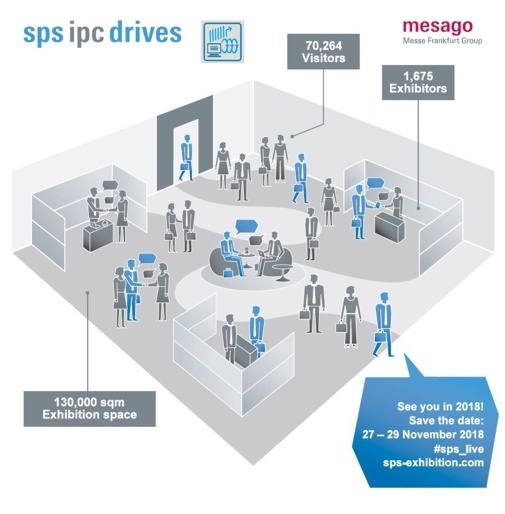 Q: Looking back at this year’s SPS IPC Drives event, what stood out the most to you? A: It’s always great to see old/new colleagues and meet with customers. But it’s clear that this show is as much about people networking as it is about industrial networking. Because while numerous companies and organizations are in attendance with their own booths and exhibits, there’s always a spirit of collaboration between exhibitors. Many partnership ideas are formed during events like this, which is not just a benefit for the companies involved, but really a benefit the customer. Overall, our biggest takeaway was how exciting it was to see that the topic of Industrie 4.0 is developing into a reality.